Response: Urinary tract infections are extremely common in women and many women experience recurrent episodes which impact their quality of life. 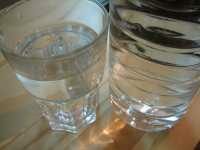 There are also many women who do not drink as much water as is recommended. This study found that in healthy women with recurrent UTIs who drink less than 1.5 liters per day, the additional intake of 1.5 liters of water daily reduced the risk of recurrent infections by nearly 50%. Response: Recurrent UTIs are common in women and drinking more water may be a simple way to reduce these infections. Response: One risk of recurrent UTIs is antibiotic resistance and it would be good to study if prevention of recurrent infections can reduce the likelihood of antibiotic resistance from developing. Response: There is ongoing work from this trial evaluating impact on quality of life and cost-effectiveness of this approach to prevention. This entry was posted in Author Interviews, JAMA, Urinary Tract Infections, Urology, UT Southwestern and tagged JAMA, urinary tract infections, urology, UTI, UTSWNews by Marie Benz MD FAAD. Bookmark the permalink.